That's a very nice one, with the late 1940s opener (I think) ánd scissors. 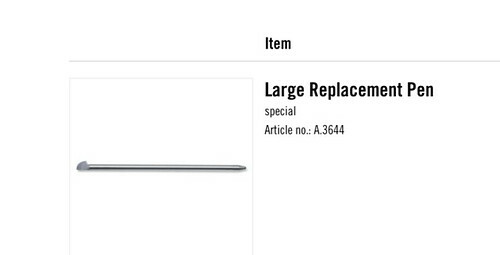 Thank you, do you think it's 84mm or 91mm? I can't tell. 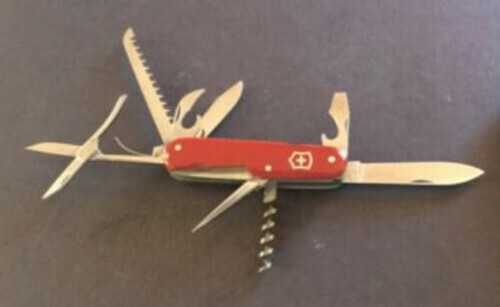 Victorinox nail clippers for about $8 should help with the budget, maybe spread out into the cutlery dept and get a paring knife? Just giving some suggestions cause this sounds like it could drain your wallet if your set on completing challenge and lose an auction and need a quickie Vic so you don't overpay on something. Good ideas Blackbeard, thank you. Thank you Wspeed. Right when I think I have enough exposed rivet SAKs, another pulls me in. That look nice! Great score! 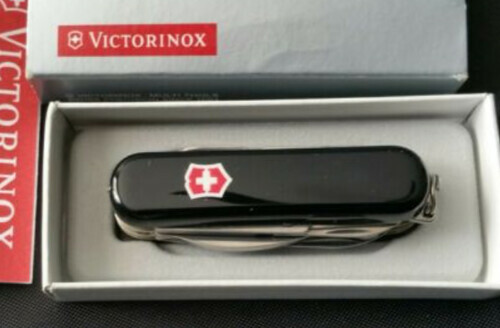 Have you been hired by Victorinox to get fans all ginned up to boost Q1 sales or something? More power to ya, but I'll just be watching. Worst case scenario, head over to Def's get em before they go to Ebay thread. You didn't say they have to be new. You didn't say they have to be new. True, they can be new or used, although I do prefer mint-in-box. I hope it's something on my top 10 list! Found a SAK to buy at 9 PM my time. Whew! Thank you all, and yes, so far 2 for 2. I'm thinking a toothpick buying day is coming up soon. Wow. Nice start so far. Kinda wish I saw this one first!! Good luck today! Just found this thread, FB! I'm with you so far, just got some SAKs and Scales and have more coming, I'll do my best to get some pics up. Wish I could find another one. Day 3 and I haven't bought anything yet. Still have 4.5 hours. Cool EL C! Post up some photos when you can. You needed a "light" day after all the purchases you have made recently. Day 4 - I bought the one shown below today. I like MiniChamps (they're big Vagabonds to me ) and this one caught my eye as I haven't seen a black scaled one. Plus it seems it has an LED, so the Midnite version. I thought it might be a scale switch, but then I can't see any reference to black cellidor w/LED in the SAKWiki. But then maybe it isn't an LED version. That is a looker for sure! Thank you RR and Wspeed. I found one that is similar on an ended auction. It has a red LED and L.L. Bean on the other scale....so when it arrives I'll know if it is one of those.